About Social Beat – Social Beat is South India’s leading digital agency with offices in Bangalore, Chennai, and Mumbai. Social Beat is a premier Google Partner, Member of Facebook India SME Council. They have a rich experience of working with various clients across verticals like Real-estate, e-commerce, hospitality, and Wellness etc. Honoring its exceptional accomplishments, in the Digital Marketing space, Social Beat was awarded the Best Social Media brands awards for its social media marketing efforts. Social Beat’s co-founder Suneil Chawla was awarded the Best Digital Marketing Professional by SMO Council and the Outstanding Digital Person of the Year award at the Digital Marketing Conclave & Awards by Think Media and VIT University Business School. In 2016, Vikas Chawla was recognized as one of the Most Influential Digital Marketing Leaders by CMO Asia. A book about Digital Marketing, coming from the house of Social Beat, an established digital agency, makes it one of the most sought after books in the online marketing circles. 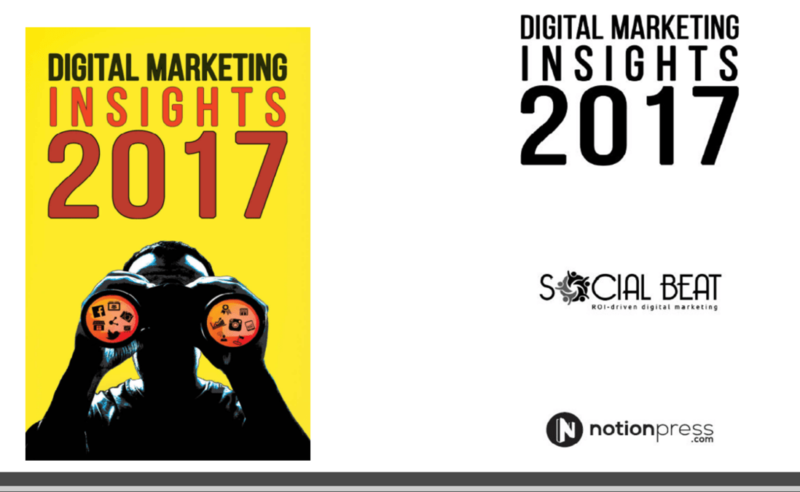 In those terms, Digital Marketing Insights 2017 hits all the right notes. Right from the structure, the content and the layout has been created keeping in mind that the book will serve as a quick reference guide. This is a definitive guide for someone trying to understand and explore the Digital Marketing Arena. Digital Marketing grew organically and then exploded on the marketing scene world over. When India caught up with the world trends, there was a lot happening already and we had to catch up real fast. Hence there was never a structured learning in place when it came to Digital Marketing. 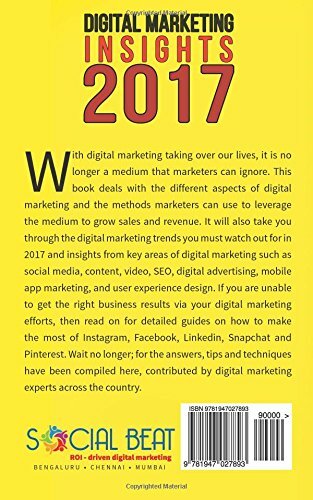 This book acts as a stepping stone for those looking to explore and understand the Digital Marketing Space and it does a good job at that. Currently, there are a lot of Digital Marketing schools or online courses. I would definitely recommend this book to those pursuing such courses as it gives a detailed idea of what they need to prepare for. The book chapters are well organized and they start by forecasting trends for 2017 along with Industry Report for 2016. This acts as a great guideline for marketers and clients looking to benefit from online marketing in 2017. It further explores each social media channel starting with the most popular one in India. This helps as there are very little insights about India specific data for social media marketing. Then the book moves on to other aspects of digital marketing like the content marketing, UX and Web Design, Video Marketing etc. The book does a good job of explaining the approach to a client or business that a person should take before getting on with their Digital Marketing. One of the few books available in the market that focus on Indian audience and their thought process. It rightly touches upon the rise of content in local languages and how the Year 2017 could be the year of exponential growth in local language content. Influencer marketing is something that has not been given its due credit in the Indian marketing sector; however, the book puts the focus on its importance and showcases new ways of exploring this under-utilized opportunity. It also touches upon app marketing, which is comparatively new and still catching up in India. The Industry Report for 2016 helps with deeper understanding of the market shift and current trends that the businesses should focus on. Social Beat has established itself as a thought leader in the industry. I bought a Kindle Version of the book and it was certainly worth it. Overall I would rate the book a four and a half star and definitely suggest it to all those trying to get a foot hold in the online marketing industry. This looks like an interesting read! You have shared all the points very clearly! Helpful! I am going to buy this. It’s going to be useful. I am not much into non fiction. But your review is to the point. Since we all basically dwell in digital marketing adding to tbr. Maybe one day I’ll pick this up. Nice book I must buy it soon I like to stay on top of my game and strategize for better results. There is no doubt this book can enlighten me and provide good tips thanks! Thank for this thorough and very informative review! I’d love to pick this book up, as I’m becoming more aware of digital marketing, myself. I’m looking forward to getting this book, using it’s tips and seeing results. Sounds like a win, win all around. Sounds like a great book for social media gurus. I know that social media is always evolving and changing, so it’s nice to find information to help you where you are today. I’m always looking for books to increase my knowledge. I love my Kindle, but for some reason, I can’t do “learning books’ on the Kindle. I tend to learn better from a paper book still and use my kindle for books to just read for pleasure. Sounds like an interesting read. It’s amazing how digital marketing has changed and so quickly. It does sound like such a great book. I am definitely curious about the coming trends in social marketing and this definitely sounds like something that’s a must have primer. Digital Marketing sounds like an interesting book. It sounds like it has a lot of great tips. Clearly, there’s plenty to learn about digital marketing and its scope. This book will make it easier to learn. Thanks for sharing your experience with it! This sounds like a very interesting book – I need to check it out soon!! This is an area where I definitely need extra extra assistance in! I need to set aside time and look into this!